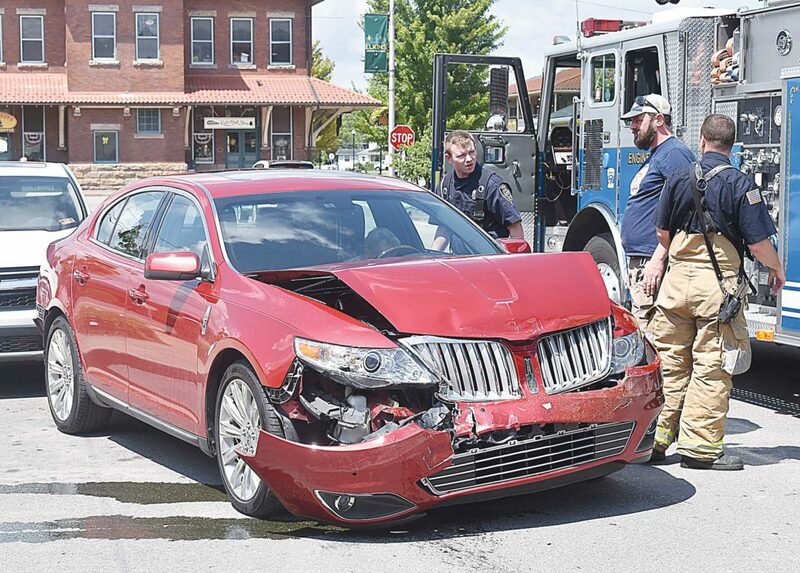 The Inter-Mountain photo by Tim MacVean A Lincoln MKS struck two vehicles during a four-vehicle accident at approximately 12:15 p.m. Tuesday on Third Street in Elkins. After rear-ending a Dodge Ram 1500 pickup truck and pushing it forward into a Kia Sorento at the Third Street and Davis Avenue stoplight, the Lincoln’s accelerator was still depressed when the driver placed the car in reverse, causing the vehicle to accelerate backward into a parked Honda CR-V, officials said. There were no injuries reported as a result of the incident. Sgt. M.J. Sigley, and Patrolmen D.T. Sayre and R.A. Summerfield, all of the Elkins Police Department, responded to the scene along with Elkins Fire Department and Randolph County EMS.